2013 has been a great year so far for singer and recording artist Lakotah. Her debut solo single climbed the US Billboard Dance Music chart to the top 40s. 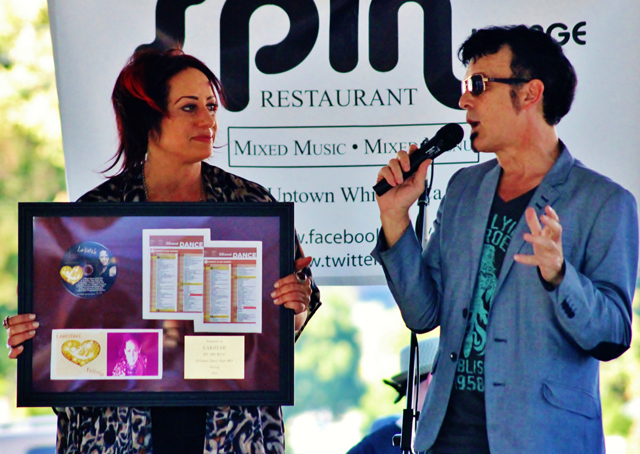 Longoria presented an award to Lakotah at her live concert in Southern California recently. After this recognition Longoria asked Lakotah to join on the TV show for a continuation of her national success. Welcome To The World airs regularly on the network’s 450 affiliates across the US and Canada. “We were excited to have Lakotah on the show and feature a glimpse of her personality, “says producer Robert Eibach. This interview will coincide with the launch of her all new website in June. “My new website will be featuring my newest music as well as my daily twitter feeds, behind the scenes videos, my photo galleries and my schedule for live appearances and performances,” explains Lakotah. The website is operational now at www.lakotahonline and will roll into the new fresh look and completion on June 17th. Longoria and Lakotah taped the interview last week in Studio CIty, CA at the studios of the 24k Music Network.